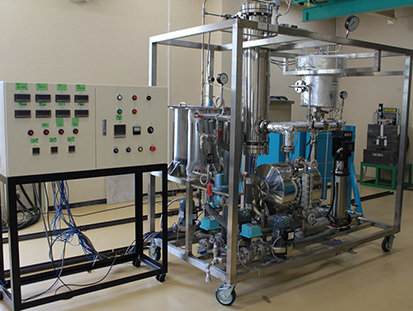 Kyoto University Research Reactor (KUR) is a light-water moderated tank-type reactor operated at the rated thermal power of 5 MW. The core consists of plate-type fuel elements using about 20% enriched uranium and graphite reflector elements. KUR is operated by using four shim rods and a regulating rod; those are made of the stainless steel containing boron. The core is constructed at the bottom of the aluminum core tank with the size of 2-m diameter and 8-m depth, which is filled with light-water. KUR is widely used for the experimental studies in physics, chemistry, biology, engineering, agriculture, medicine etc. Since its first criticality in 1964, it has been successfully operated for over than 40 years, and has served as one of the most useful inter-university research reactors in Japan. By reflecting the lessons learned from the accident of TEPCO’s Fukushima-Daiichi Nuclear Power Plant which occurred on 11th March, 2011, the Nuclear Regulation Authority (NRA) has formulated the regulation rules for research reactors, and all the research reactors in Japan have to renew the license under the new regulation rules. Then, KUR has been shut down since May 2014 to have the safety review by the NRA, and carried out the subsequent refurbishment of the facility including the inspections by the NRA. In August, 2017, KUR obtained the new license for operation and started its operation for joint-research works. Users can irradiate samples at the center of the reactor core. The thermal neutron flux at 5 MW operation is 1.06 x 1014 n/cm²/s. The sample encapsulated in an aluminum capsule is transported from the top of the reactor to the center of the reactor core through a tube. The irradiated capsule is transferred to a canal of hot cave room at hot laboratory. This irradiation facility is used for neutron activation analysis, isotope production and other research purposes in fields of chemistry, physics, earth and space science, material science and others. Three pneumatic systems (Pn-1, Pn-2 and Pn-3) are available for neutron irradiation of samples. Samples are transported from hot laboratory to the reactor core using a polyethylene capsule. The irradiation position is in the graphite reflector beside the core and thermal neutron fluxes at 5 MW operation are 1.89 x 1013, 2.78 x 1013 and 2.39 x 1013 n/cm²/s for each system, respectively. This irradiation facility is used for neutron activation analysis, isotope production and other research purposes in fields of chemistry, physics, earth and space science, environmental science, medical and biological science, material science and others. Large-size samples can be irradiated using the slant exposure tube. The irradiation position is outside of the graphite reflector, and the thermal neutron flux at 5 MW operation is 4.82 x 1012 n/cm²/s. An iron-filtered beam facility was installed in the beam hole B- 1 with an iron-filter of 45 cm in thickness and an aluminum filter of 35 cm in thickness to obtain quasi-monochromatic neutrons near 24keV. The characteristic neutron spectra were studied by a transport calculation and also by measurements using a spherical proton recoil counter and activation foils. The neutron flux at 24 keV was estimated to be about 6.8×106n/cm²/s behind the filters. The absorbed doses just behind the filters and the position at 50 cm behind the filters were about 1 Gy/h and about 0.05 Gy/h, respectively. The Heavy Water Neutron Irradiation Facility (HWNIF) was updated in March 1996, mainly for an improvement in boron neutron capture therapy (BNCT). The main purposes of the updating were as follows: (i) an improvement in the safety and maintainability of the facility, (ii) an improvement in the performance for BNCT utilizing both thermal and epi-thermal neutrons, and (iii) the realization of BNCT clinical irradiations during full-power continuous KUR operation. This facility has a heavy water tank of approximately 2 m3 adjacent to the KUR core. In the heavy water tank, an aluminium-heavy water mixture (Al/D2O=80/20 in volume percent), and a neutron-energy spectrum shifter of heavy water whose thickness changed from 0 to 90cm, are installed in order from the core side. Outside of the spectrum shifter, two thermal neutron filters of 1mm-thick cadmium plate are installed. The energy spectrum of the neutron beam can be controlled from almost pure thermal to epi-thermal within five minutes by remote control under a continuous reactor operation. After the updating, the KUR Advanced Irradiation System for BNCT was organized. Clinical irradiation utilization under the full-power continuous KUR operation can be performed by employing both a Radiation Shielding System consisting of a shielding door and an irradiation room, and a Remote Carrying System for a patient. The safety and utility of the facility are kept by the Safety Observation System. As of the end of July 2018, 510 BNCT clinical irradiations have been performed, namely, 254 for brain tumours, 193 for head and neck tumours, 27 for malignant melanomas, 44 for lung tumours, 10 for liver tumours, and 19 for tumours of the other body-parts, using the three standard irradiation modes of thermal-neutron, mixed-neutron and epi-thermal neutron. When low energy neutrons are incident on a nickel mirror evaporated on an optically flat glass, total reflection occurs below the critical angle which is a function of the reflecting material and neutron wavelength. The long neutron guide tubes utilizing the total reflection of the nickel mirror were constructed in E-3 as the first neutron guide tube in Japan, for extracting thermal neutrons to a distant wide experimental hall of 10 meters away from the reactor. The nickel/titan supermirror composed of layers whose thickness are varied gradually layer by layer, has a reflective angle larger than the total reflection angle and reflects neutrons with a wavelength range shorter than the nickel mirror. The supermirror guide tube in B4 is the first one in the world. The neutron flux at the exits are 2 x 106n/cm²/s (E3 for prompt gamma-ray analysis for BNCT), 5 x l07n/cm²/s(B4 for neutron imaging), 5 x 107n/cm²/s(CN-2 for SANS) and 2 x 107n/cm²/s(CN-3 for neutron reflectometry and neutron device development). The Slow Positron Beam System provides positron beams through the electron-positron pair-creation reaction with reactor γ-rays for materials analysis by positron annihilation spectroscopy. Positrons generated at the source position with energies of the order of 10 eV are extracted and fed into the beam line, accelerated up to 30 keV before sample irradiation. Positrons recombine with electrons and emit two γ-rays of 0.511 MeV. Positron lifetimes and Doppler broadening can be measured from the emission time and the energy dispersion of annihilation γ-rays. It is well known that when positrons annihilate at atomic-scale vacant spaces such as vacancies and voids, positron lifetimes get longer and also Doppler broadening is influenced. It is possible to obtain information of vacant spaces based on these phenomena. Slow Positron Beam System (B−1). 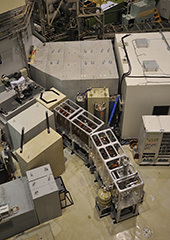 A neutron irradiation apparatus using B-2 beam hole was installed in 2012. Samples on a truck are transported from a neighboring measurement room into the B-2 beam hole to be irradiated by neutrons. Samples of large size (60 mm × 60 mm × 300 mm) and liquid form (static or flowing liquid) can be irradiated. Monitoring and controlling irradiation conditions are feasible by connecting the transport truck and monitoring/controlling devices in the measurement room with cables. Variable irradiating position enables neutron irradiation with a range from 107 to 1011 n_th/cm2/s. Irradiating neutron spectrum is also variable by placing neutron shielding/moderating materials around samples on the transport truck. 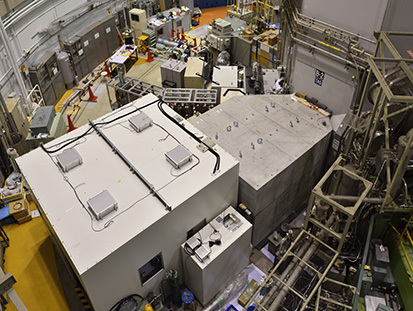 Neutron imaging can be performed using thermal neutrons generated in the Kyoto University Research Reactor (KUR), which has two irradiation port; E-2 port and B-4 guide tube room. E-2 port is located in the reactor room of the KUR, which has relatively large field of view (ϕ15mm) with the thermal neutron flux of 3.2×105n/cm2s. This port is mostly utilized to obtain the static images including 3-D computed tomography. B-4 neutron guide tube facility has the world’s first super mirror neutron guide tube. The thermal neutron flux of B-4 port is 5×107n/cm2s at 5MW thermal power of the KUR and it is possible to apply not only for static image acquisition but also for dynamic imaging using a high speed camera combined with an image intensifier.B-4 guide tube room is equipped with a stabilized DC power supply (max. 20 V, 1200 A) and a cooling water unit for boiling two-phase flow researches. Furthermore, X-ray imaging system has been installed for complementary use to neutron imaging. This facility has an improved control capability of irradiation conditions, such as irradiation temperature and atmosphere. The irradiation temperature of specimen is between 340K and 773K. The neutron flux is 9.4 x 1012n/cm²/sec (E>0.1MeV) and 3.8×1013n/cm²/sec (all). The maximum size of specimen is Ø38mm x 60mm. The photo is the specimen loading chamber. The On-Line Isotope Separator (ISOL) is an apparatus used to study short-lived nuclides produced by thermal neutron fission reaction. A target of 93% enriched 235U is irradiated by a thermal-neutron flux of 3 × 1012 n/cm²/s and produced fission fragments are transported to an ion source by a gas-jet within a few seconds. The ionized activities are extracted from the ion source and accelerated up to 30 keV. They are electromagnetically focused and mass-separated to form a chemically pure atomic beam of the nuclides to be studied. In this system, a surface ionization ion source is employed to ionize efficiently alkali elements (Rb, Cs), alkali-earth elements (Sr, Ba) and light rare-earth elements (La, Ce, Pr, Pm and Nd). The RI beams thus obtained are used to study the nuclear structure by nuclear spectroscopy, and to apply nuclear methods to solid state physics by, e.g., a perturbed angular correlation (PAC) technique. A post accelerator is equipped to implant the RI ions with the kinetic energy of up to 200 keV. Small-angle neutron scattering (SANS) is an experimental method to analyze nanostructure and frequently used for various materials such as polymers, micelles, proteins, metals, and magnetic materials. 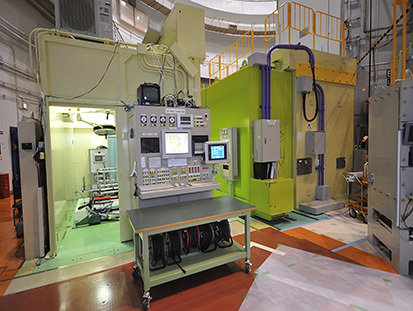 A SANS instrument equipped with a multilayer monochromator, a 3He two-dimensional detector, and a transmission monitor is installed at CN-2. Compared to a neutron velocity selector used at general SANS instruments, the multilayer monochromator is compact, highly stable, and easily maintained. The wavelengths of 0.3 nm and 0.46 nm are available. A magnetic field of 0.5 T can be applied to the sample. The data acquisition system operates in an event-recording mode, which enables flexible data reduction. CN-3 neutron beam port is installed to cold neutron source (CNS) at KUR. 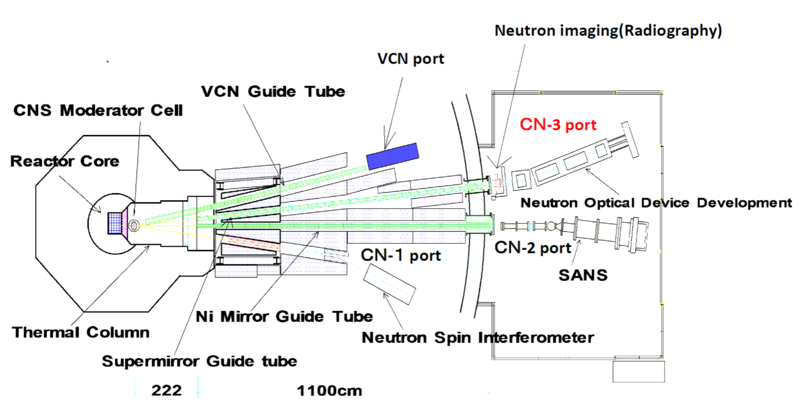 Figure 1 shows the KUR and cold neutron beam lines installed to the CNS. The CN-3 beam line has a curved neutron guide tube and the neutron flux of 5 MW KUR operation at the guide exit is 3.8×106 n/cm2/s when the CNS does not operate (CNS-off) and 1.9×107 n/cm2/s with CNS-on. Unfortunately, the CNS does not currently operate and the neutron intensity can be used with CNS-off only. The neutron flux of 1 MW KUR operation at the guide exit is 7.6 ×105 n/cm2/s. The curvature radius of CN-3 guide tube is 441 m and the guide tube consists of 15 element in which length 700 mm. The total length of the CN – 3 guide tube is 10.5 m. The characteristic wavelength of CN-3 guide tube is 0.24 nm and the cross section of the beam size is 20 mm in width and 90 mm in height. Available neutron wavelengths are about from 0.15 nm to 0.5 nm. By using such curved guide, there are little neutron in which wavelength is shorter than 0.1 nm, and intensities of fast neutrons and gamma rays are really very low. Figure 2 shows the schematic top view of the CN-3 beam line. A shielding for neutron and gamma ray is permanently installed around the CN-3 beam shutter, and a neutron chopper is installed in it. In response to new regulation standards for research reactor in Japan, a fire shutter system is also installed to the beam shutter. There is a space of about 300 mm in the direction of neutron beam between the fire shutter and the neutron chopper. It is possible to conduct neutron imaging (radiography) for relatively small sample and neutron detector test requiring high neutron flux with low background. Downstream of the shielding, an optical bench with a length of 3 m is installed and it is used for neutron optical experiments such as neutron reflectivity measurement. Fig. 1. Schematic top view of KUR and neutron beam lines installed to cold neutron guide hall. Fig. 2. Schematic top view of experimental arrangement at the CN-3 beam line. Iron (Fe) has a deep minimum (~0.4 b) in the neutron total cross section at 24.3 keV. As a result, neutrons near to the minimum are efficiently transmitted through thick Fe-filters, as a neutron window. Quasi-monochromatic neutrons near to 24 keV can be obtained by applying this property from a continuous spectrum in a reactor. Thick Fe-filters have been installed in beam tube No.1 (B-1) of the Kyoto University Research Reactor (KUR). By making reactor neutrons penetrate through Fe-filters of 45cm in total thickness mixed with aluminum (Al) filters of 35cm in total thickness, a Fe-filtered neutron beam at 24 keV has been extracted. 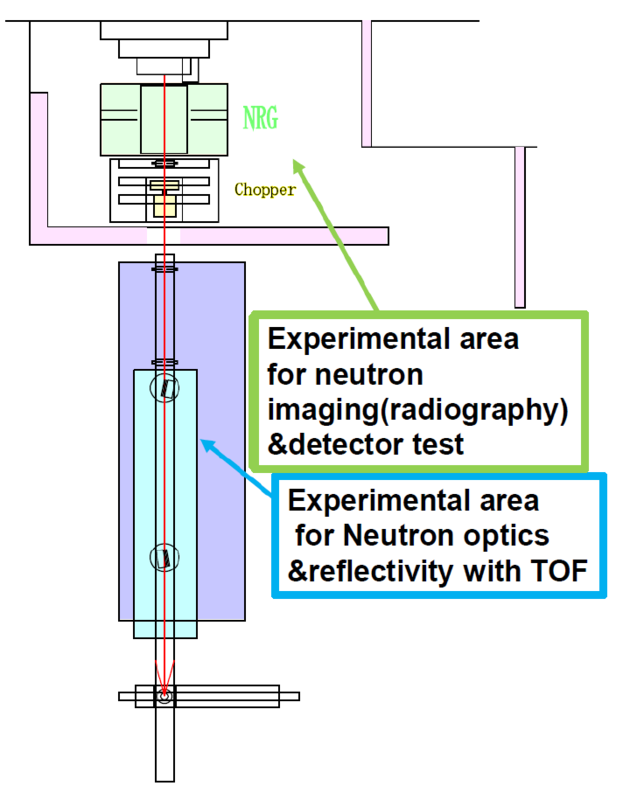 The following characteristics have been achieved: (1) The neutron flux of the Fe-filtered neutrons at 24 keV is about 8 x 106n/cm²/s at the deepest position of the B-1 tube, and (2) the gamma-ray dose is about 1 Gy/h. At the irradiation position of 46 cm behind the filters, the neutron flux is about 5 x 105 n/cm²/s, the gamma-ray dose about 0.023 Gy/h and the absorbed dose 0.055 Gy/h. This facility is very useful for fundamental studies in, biology, medicine, physics, engineering, detector/dosimeter calibrations and so on.